Clear glass painted in black pigment and yellow (silver) stain. This roundel depicts the Old Testament story of 'Joseph and Potiphar's Wife'. Joseph was the son of Jacob and Rachel. Out of jealousy, his brothers sold him into slavery in Egypt. Genesis 39: 7–20 tells how Joseph became a valued servant of Potiphar, an official of the Egyptian pharaoh. Potiphar's wife tried to seduce Joseph but he rejected her advances. In a fit of jealousy, she denounced him to Potiphar, who had Joseph imprisoned. Such a story would have been popular in domestic settings illustrating the Commandment against desiring someone's wife or husband. In such a context, it may have formed part of a series of roundels illustrating the Ten Commandments. There is another roundel in the V&A (Museum no.C.138-1931) depicting the Old Testament story of 'The Judgement of Solomon’, which was used to illustrate the Commandment against bearing false witness. It is very likely that these two roundels were made in the same workshop. The style of the figures with their rounded features and the method of painting, sparse linear drawing but with thick matt black washes and stippling, would indicate that this roundel was produced in a northern German workshop about 1520. Such roundels were produced on an almost industrial scale in Northern Germany and especially in the Lowlands centres such as Amsterdam and Leyden. The demand for decorated glass panels had been increasing amongst the middling classes since the latter part of the 15th century. More and more people were living in urban centres and glazing their windows. Small roundels such as this one were affordable and were inserted into windows in private homes and in professional buildings such as guildhalls. These painted glass roundels were intended to be viewed at close quarters and their owners would have chosen the subject matter to suit their own purposes and tastes. There was a trend for displaying decorated roundels with moralising images, and many of these roundels depicted scenes from the Old Testament of the Bible. They could be single scenes or could have formed part of a group. Potiphar's wife is shown wearing early 16th century dress standing next to a bed in the centre of the panel. She grasps Joseph's cloak in her left hand as he attempts to flee from her through a door on the right of the panel. Joseph is represented with long hair and full sleeved tunic. Between the two figures in the background is Gothic linenfold and other wood panelling in an arcaded paved passage. In the foreground is a covered circular wicker basket. The style of the figures in this roundel with their rounded features and the method of painting, sparse linear drawing but with thick matt black washes and stippling, would indicate that this roundel was produced in a northern German workshop about 1520. Such roundels were produced on an almost industrial scale in Northern Germany and especially in the Lowlands centres such as Amsterdam and Leyden. The demand for decorated glass panels had been increasing amongst the middling classes since the latter part of the 15th century. More and more people were living in urban centres and glazing their windows. Small roundels such as this one were affordable and were inserted into windows in private homes and in professional buildings such as guild halls. These painted glass roundels were intended to be viewed at close quarters and so their owners would have chosen the subject matter to suit their own purposes and tastes. There was a trend for displaying decorated roundels with moralising images. Many of these roundels depicted scenes from the Old Testament of the Bible. They could be single scenes or they could have formed part of a group of scenes such as the story of 'Tobit and the Archangel Raphael'. This roundel depicts the Old Testament story of 'Joseph and Potiphar's Wife'. Joseph was the son of Jacob and Rachel. Out of jealousy, his brothers sold him into slavery in Egypt. Genesis 39: 7–20 tells how Joseph became a valued servant of Potiphar, an official of the Egyptian Ppharaoh. Potiphar's wife tried to seduce Joseph but he rejected her advances. In a fit of jealousy, she denounced him to Potiphar, who had Joseph imprisoned. Such a story would have been poular in domestic settings illustrating the Commandment against desiring someone's wife or husband. In such a context it may have formed part of a series of roundels illustrating the Ten Commandments. 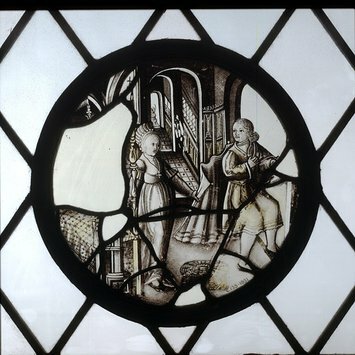 There is another roundel in the V&A (Museum no.C.138-1931) depicting the Old Testament story of 'The Judgement of Solomon' which was used to illustrate the Commandment against bearing false witness. It is very likely that these two roundels were made in the same workshop.